As a male American born in the last 50 years, I can say with confidence that the mythical figure of James Bond has influenced my upbringing and views on action movies. 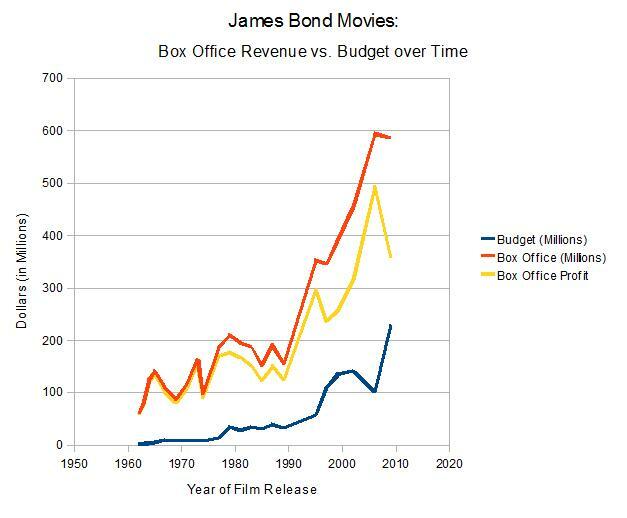 The Bond series has grossed $1.6 billion in the box office, making it the #3 most successful movie series of all time. The early movies turned Sean Connery into a legend, and built up the "action-movie cred" for the following Bonds. Through the Cold War and beyond, James Bond resonated with a culture that glorified adventure and perceived itself in a global struggle against evil. However, the times seem to be turning against iconic 007. The early Bond movies were ground-breaking in their well-developed spy plots, advanced special effects and risque sexual innuendo. As the franchise wore on, paying for the latter two elements seems to have been put ahead of the plot. The first Bond film, Dr. No (1962), had a budget of just $1,000,000 while the most recent, Quantum of Solace (2009) cost a whopping $230,000,000 to produce. 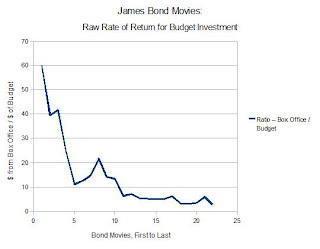 The rapidly rising budget for each Bond film can be seen in the graph above. While all of them have turned a box-office profit (shown in yellow) it hasn't been enough to keep MGM out of the red. So far, the studio hasn't been able to find a buyer, and so the 23rd Bond film has been put on hold indefinitely. No one's willing to buy out the legacy of James Bond, even at a fire sale price? That decision makes more sense when looking at this second chart, which measures the ratio of box office revenue over each movie's budget. 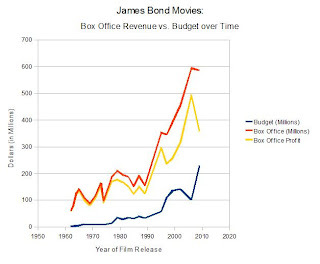 The multiple on early bond movies is very high, with box office revenues at 60x budget for Dr. No, around 40x for the next two movies, then steadily down from there. Looking at a graph like this, potential MGM investors must be wary to say the least. The most recent bond film had a paltry ratio of $2.55 in the box office for each $1.00 of budget, a record low for the series. With those numbers, it's no surprise that Bond has been hung out to dry (along with a number of other highly awaited film titles). 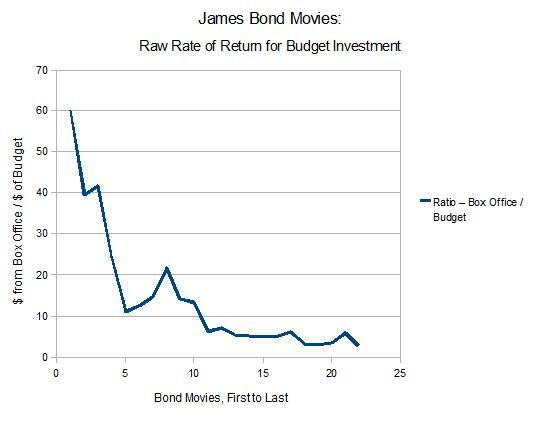 Unless there's a fundamental change to the high-budget Bond formula, we're more likely to see "Traveling Pants V: the Seam Goes Out" in theaters before the reappearance of 007. Data for the graphs taken from the James Bond Wiki.